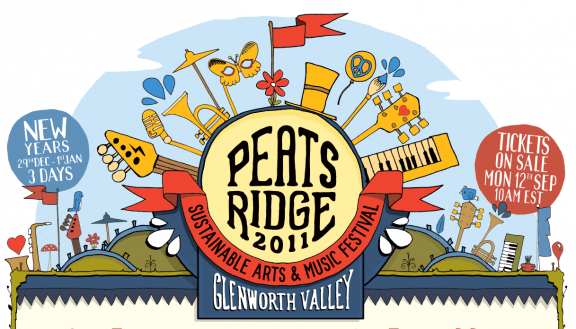 Music News Australia: Peats Ridge adds 78 more acts to their Bill! 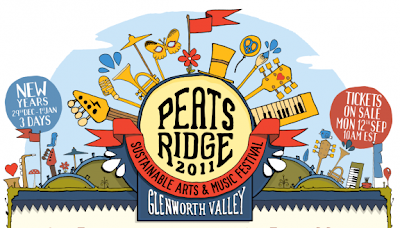 Peats Ridge adds 78 more acts to their Bill! After scouring through over 1,000 music applications for the 2012 Festival, Peats Ridge Sustainable Arts and Music Festival announce a final 78 acts – rounding off their music line-up, with a phenomenally massive 140 total acts set to rock the Glenworth Valley over 3 days from 29 December 2011 – 1 January 2012. Having been a stepping stone to many of Australia’s most recent successful musical acts - think Angus and Julia Stone, Temper Trap, The Jezabels, Kate Miller–Heidke and Cloud Control – Peats Ridge are confident that they have once again discovered the next hot ticket bands to play at this years Festival. “We’ve also added Youri Blow, an amazing French singer and guitarist. He’s going to perform his most recent album release ‘The Corridor’. It’s this beautiful dark and ethereal sound, quite different from anything I’ve heard.” Says Grant. With different stages dedicated to every type of musical genre, Peats Ridge has tailored pockets for every type of music junkie out there. The main stage, Bellbird will be drenched in red sunset, surrounded by trees and gently hugged by the beautiful Glenworth River. This stage plays host to the big name Australian and International acts on the bill and will be the spot where festival fans can catch Gotye as he belts out his ARIA topping hits over the special midnight set. The Wonderdome, housed in the Arts precinct Wonderland, becomes a musical feast for the ears at night with a swag of some of Australia’s top producers. Sitting alongside enchanting performances and quirky acts in the Festival’s new black-out dome theatre, the space is set to come alive with the eclectic mix of artists Peats Ridge have become famous for. Under the big top at Lyrebird there’s a whole lot of booty shakin’ to be found. With indie, funk, breaks, world music and even a bit of dub – Everyone is invited to let their hair down and prepare to dance the night away in this rockin’ space. For the weary travellers out there, chilling out to an acoustic set at the Chai Temple is the way to go. Or cut the grass at the outdoor dance space – Pirates Lair. Cutting edge electronic DJs. Ambient, dubstep, minimal techno, psytrance and dub all mix up sweet tracks at the Festival’s very first Pirate Ship stage – A partnership bought to Peats Ridge by the Noisy Chicken Crew, Subsonic Music, Foreign Dub and Frequency Lab. Now in its eighth year representing the best and brightest of Australian and international music acts, Peats Ridge offers a festival experience like no other. Staged at Glenworth Valley along rolling green riverbanks (29 December - 01 January), the Festival is just an hour’s drive from Sydney - ideal for a three day New Years camping escape. With a focus on creating a total experience for all, Peats Ridge hosts a brilliant showcase of art installations, kooky themed venues, multimedia, theatre, dance, cabaret, comedy, giant trapeze, and much much more, all winding along the riverbank and dotted throughout the event site. As well as this the Festival is also very family friendly with a full program organised for children and family camping facilities. The 2011 instalment of Peats Ridge is shaping up to be everything brilliant that has been offered in previous years and much, much, more. All season passes include camping and festival entry from 29th December 2011 – 1st January 2012.